Economy car hire starts with Easirent. 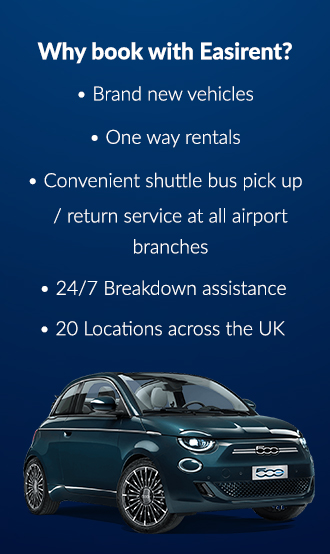 We are one of the most affordable car hire companies across the UK. Economy doesn’t have to mean a lower-specification car, it simply means getting the best deal on the market. Our fleet of cars are brand new and the range of cars includes: luxury brands, 7-seater family cars, small cars and saloons. We will do everything we can to make you as comfortable as possible and ensure your hire goes smoothly from selecting your child seats to folding down the back seats for all your luggage to fit comfortably. If you have any special requirements we will take extra care to meet them and always promise 100% customer satisfaction. Whether you are hiring a small Fiat 500 or a luxury Audi we treat every customer with the same respect and appreciation and hope you find hiring a car with us to be an pleasantly unexpected surprise! The price alone is deserving of 5 stars, however the customer service and quality of the vehicle were as good if not better than the so-called “bigger” car rental companies. All staff I spoke to in person at the branch were extremely friendly and helpful, making the whole experience a smooth one. I also emailed the reservations team, and replies were prompt and detailed. The car was almost new and spotlessly clean, we had no problems at all. Top tip is to read the T’s & C’s carefully to make sure you have the required ID and credit cards. Based on this experience, I wouldn’t hesitate to use Easirent again or to recommend them. We stock a varied range of cars from all the best-trusted manufacturers such as Toyota, Citroen, Ford, Vauxhall and Volkswagen. Our cars are not only brand new, they are serviced regularly and are repaired by the best mechanics in the area to ensure that you are driving in the safest vehicle possible. All our vehicles are modern and come equipped with a wide range of high standard technology and smart, useful gear such as parking sensors, cameras, Bluetooth connectivity, Integrated GPS/Satnav, and impressive sound systems. It is important to us that your hire car has everything you could want to make your journey that bit more enjoyable. When you drive away in an Easirent van hire or car hire, you will not be disappointed.